While grills have been mainstays in many people’s gardens or kitchens for years, smokers have failed to gain the same level of popularity. I think this is such a great shame though, as smoking meat has been one of my favorite parts of outdoor cooking since I first started way back when my fingers had only just been touched by the BBQ bug. See, smoked meat offers a taste profile that a lot of other forms of cooking just can’t match. Don’t get me wrong, I love grilled food as much as the next person, but the tastes in a cut of meat cooked at a delicately low temperature over several hours just hit the spot. You’re going to see Masterbuilt mentioned a lot in this list, and it’s for good reason. In my experience, they have almost always produced strong and easy-to-use smokers. This 4-Rack model is the perfect example of this. First of all, it’s huge. It can hold up to about 80lb of food, which is perfect if you’re anything like me and love to cook everything in batch. It has an 800-watt engine, which is very strong compared to industry standards. Its heat capacity allows cooking temperatures of up to 275°F, but is easily adjustable in order to achieve perfect low and slow levels of heat. More importantly, its heat distribution is fantastic, with no hot or cold spots evident when tested. It’s an extremely durable smoker. Its interior and adjustable cooking racks have a chrome finish that help to protect the equipment from leftover grease and burn marks. What I particularly like about this smoker is the little extras that come with it. 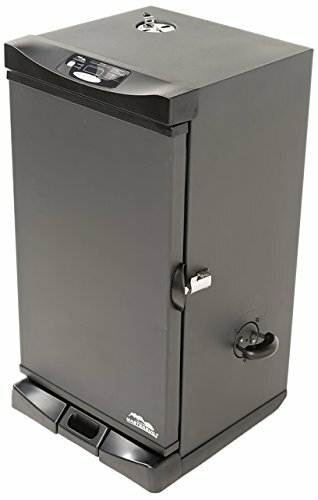 I’ve had experiences before where I’ve bought a new grill or appliance, taken it home and opened it only to find that I need to buy additional products with it. This just isn’t the case with the Masterbuilt. It comes with an onboard thermometer with a meat probe, so you can easily monitor the temperatures of the cooking environment and the internal temperature of your meat. It also comes with a remote control that allows you to set timers and set the smoker’s cooking temperature. Bonuses like these are a sure fire way to have me onboard, so Masterbuilt know what they’re doing. Finally, if you’re picky about colors (and there is no shame in that!) then you have the choice of black, blue, green, stainless or even cinnamon. I told you that Masterbuilt would feature heavily in this list. Luckily though, this isn’t just brand naming. This model more than warrants a place on this list. In terms of size, this is more modest than the 4-rack model, but the upshot of this is that it’s more affordable and therefore more accessible to smoking newcomers. This also doesn’t mean a compromise in power or quality, as its 800-watt engine matches that of the 4-rack above. 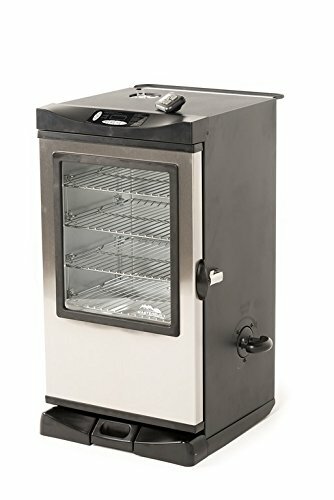 I know that temperature control can prove intimidating to newbies, but also more experienced grillers (believe me, I’ve had more issues than I’m willing to admit). 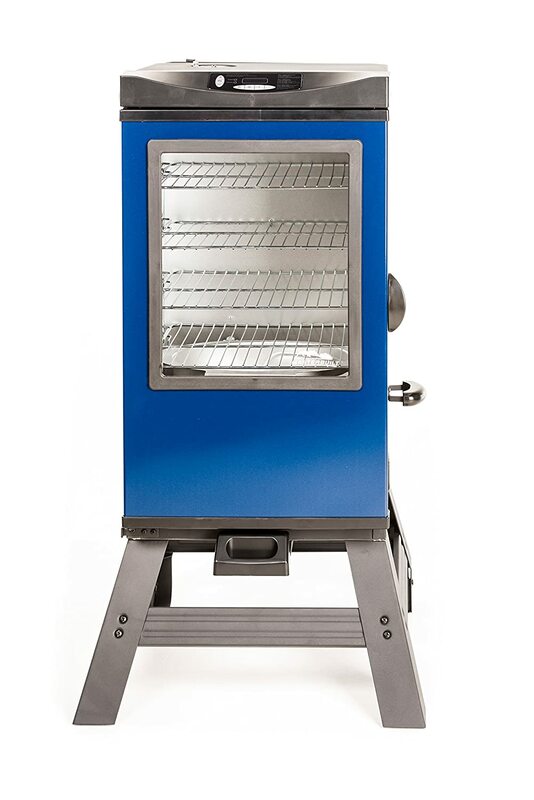 Electric smokers come armed with fantastic means of temperature control though, and this particular model has one planted on its top. It also has a side loading compartment for easy wood chip loading. If you’ve ever had the pleasure of smoking then you will have also had the displeasure of the clean-up operation needed after. Masterbuilt are way ahead of you though, and have made this model with removable parts and drip-tray for easy dishwasher cleaning. And while you will still need to get stuck in to the unit itself, removing the racks and trays means nothing is getting in your way. OK, this is a big smoker. It has the capacity to host up to 100lbs of meat (my eyes nearly popped out of my head just writing that). This is paired with an impressive 1200 watts of power. This combines to create an all-powerful smoking machine. So do you really need all that space? As ever, the boring answer is “well it depends on how much you want to cook…” but I also want to give you the good answer: If you want to have fun with your smoker, then absolutely. For me, smoking is about experimenting with meat cuts like rack of ribs and whole birds, and this smoker is going to afford you that space much more than any other would. Like with other models, it has a built-in thermometer and control panel, so the outlay on power certainly doesn’t mean that you need to concede anything in terms of ease of use. 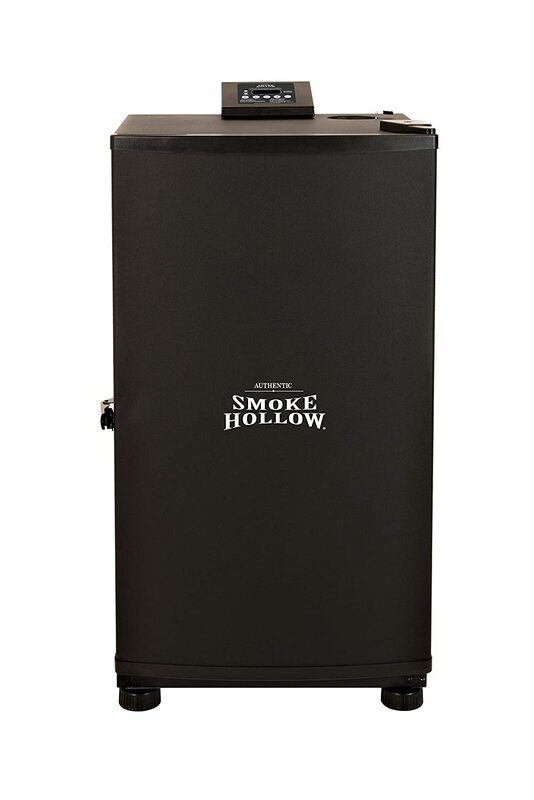 OK, by now you might be rolling your eyes at the presence of yet another Masterbuilt smoker in this list, but hear me out: This product more than warrants its place in my list. Its power compares really well to the others in this list, and can reach internal temperatures of about 275°F. In my experience, its dimensions provide enough space for between 25-30 burgers, which translates to a decent sized whole bird for smoking. It comes with Bluetooth, which is a feature that I really like. This means that you can integrate it with your phone via an app, allowing you to control your smoker from there. Technology and I haven’t always gotten along, but I love this feature. Like a lot of the other smokers in this list, it has a built-in meat probe thermometer, but crucially it also has an air damper. This helps you maintain good smoke flow while in use, which in turn helps you control temperature as best as possible. “What’s that?” I hear you say, “a non-Masterbuilt smoker?”. That’s right, and this beautiful little machine more than deserve its place in this list. I’ve often only associated Char-Broil with grills, but this foray of theirs into the world is smoking is very welcome. Firstly, at 725-square inches it has a good amount of capacity to take on a strong smoking session. Personally, this is the kind of size of smoker that I like to go for. One that provides ample space to experiment with, but without dominating your yard space. One of its standout features is its double wall construction and insulation. This obviously helps its heat retention in a way that not a lot of other models do. Whether it be smoking or grilling, I’ve often had temperature control problems due to heat loss, so this is a really welcome feature. Not only that, but this insulation means that its energy efficiency is excellent, meaning that you will save a fortune on wood chips and fuel. This is built with a monster 1500 watts of energy, which is all the more surprising given its relatively low price. Despite this power, it’s a light unit weighing at just 33lbs. At 250 square inches, it is quite small in comparison to some of the other units on this list, so if you’re planning on smoking food in large batches then you might want to consider something with a larger capacity. 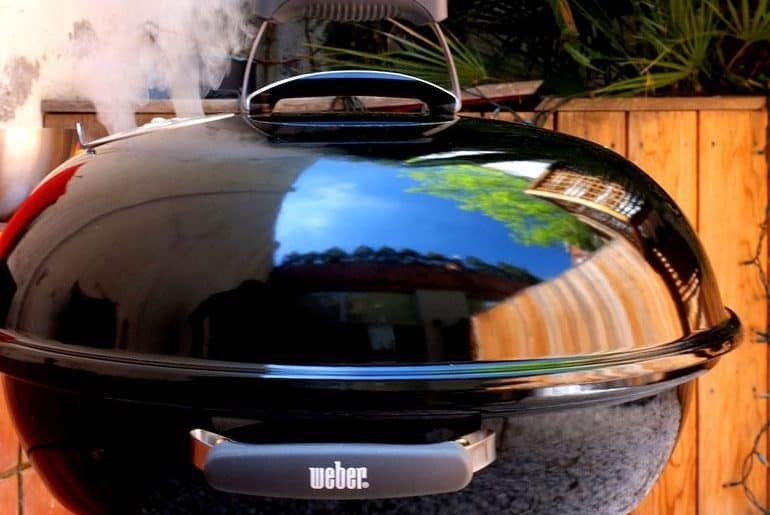 It comes with smoker essentials like a water pan, temperature control, and heat indicator. Its interior cooking grids are chrome plated, helping to make this a tough and durable unit. 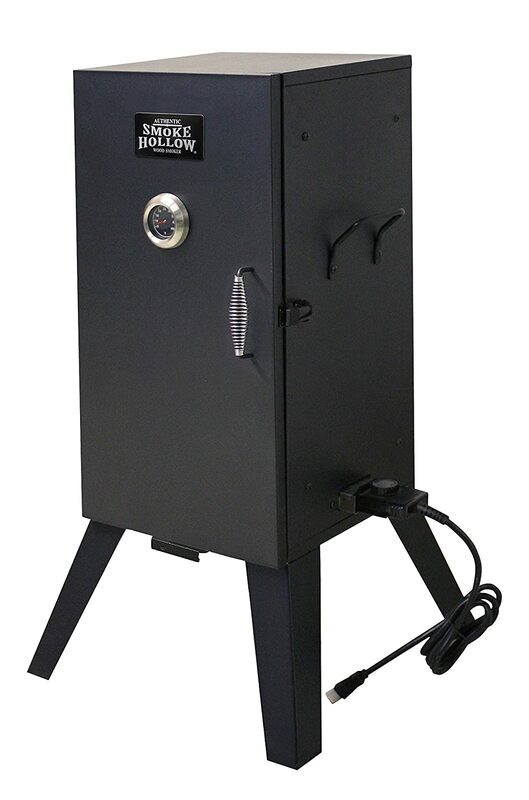 The Smoke Hollow packs in 800 watts of cooking power and offers three cooking racks, which allows a good deal of cooking space (more so than the other Smoke Hollow smoker on this list). It’s double insulated, making it extremely energy efficient and reliable. 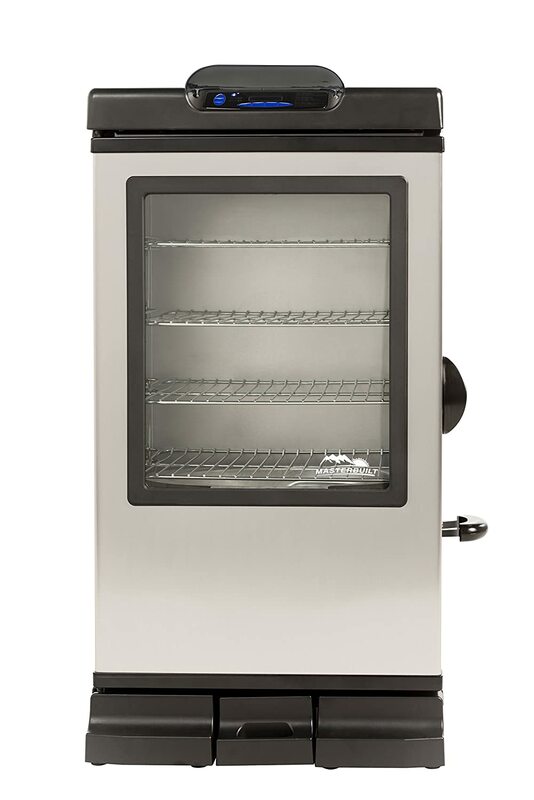 This helps maintain excellently consistent smoking temperatures throughout use. The proof of this is evident in the meat that we tested it on. All of them are evenly cooked, with a beautiful texture throughout. Should you buy it? I guess it comes down to what you want from a smoker. Is it good for simple smoking? Absolutely! It’s user-friendly for beginners and intermediates alike, and performs great for straight forward meat smoking. 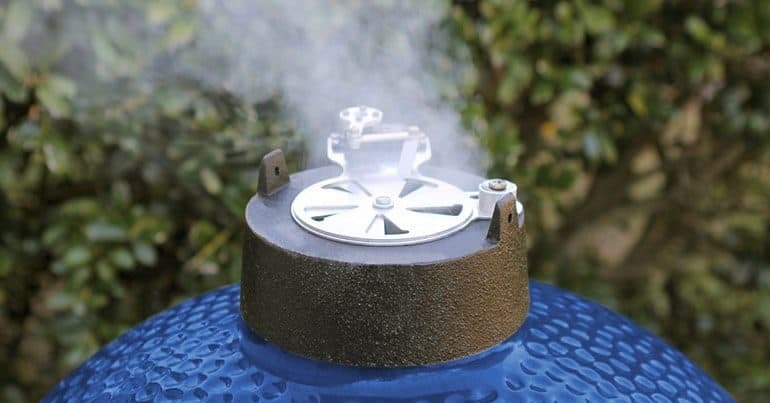 More experienced users might like something with a bit more control over air and temperature flow, but if you’re an advanced user then I would recommend that you look at charcoal smokers anyway. One of this model’s greatest assets is its sheer size. It boasts an incredible 730 square inches of cooking spread over 4 chrome-coated cooking racks. It comes armed with a remote for easy temperature control and a LED temperature display. 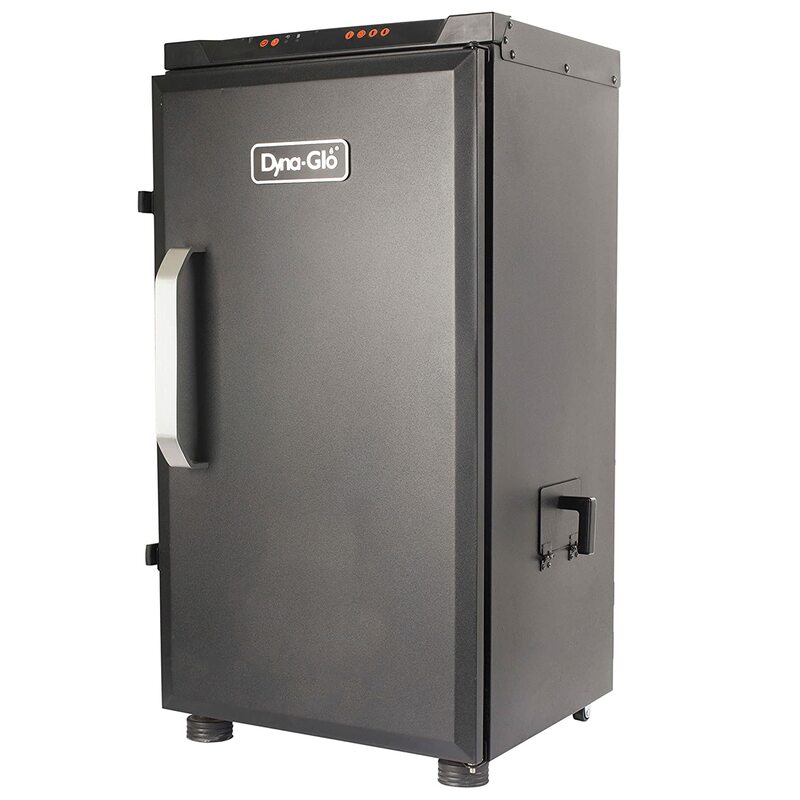 It has a great loading system for wood chips, which means that you don’t have to open the front door of the smoker to reload wood chips. It also has a drip pan which is easily accessible from the front. It comes in two sizes: One 30-inch models that has 800 watts of power, and a huge 40-inch model that has an impressive 1,200 watts. Both are brilliantly energy efficient and maintain a strong temperature flow throughout cooking time. This Masterbuilt also offers 721 square inches spread over 4 cooking racks. These racks are chrome-coated, making them durable and easy to clean. It has a fantastic range of temperature, from 100 to 275°F, all of which can be easily controlled with a remote or through its LED display. It also has a drip pan that’s easily removable for cleaning. Ease of use is at the heart of what Masterbuilt try to do with their smokers. The wood chip loading system on this model makes it easy to reload chips as you are cooking. This means that you are not having to reload via the front door, which can be hazardous and also interfere with the temperature levels within the smoker. Any cons? Frustratingly, it doesn’t supply its own internal temperature probe for the meat, making it difficult to tell if food is properly cooked without opening the smoker and checking manually. 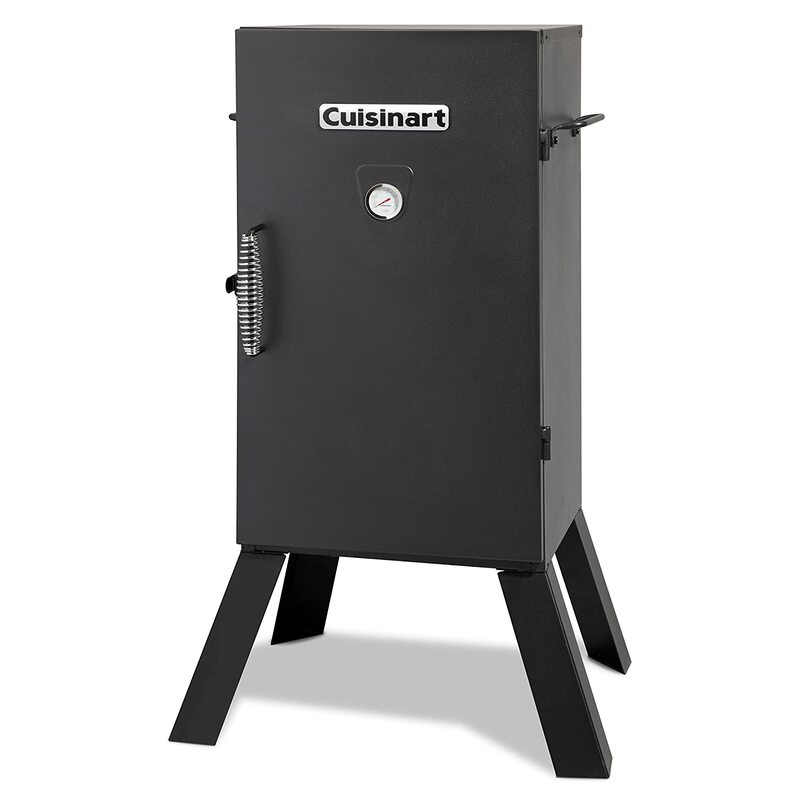 All in all it’s a high-quality, sturdy smoker that offers (almost) everything you need. 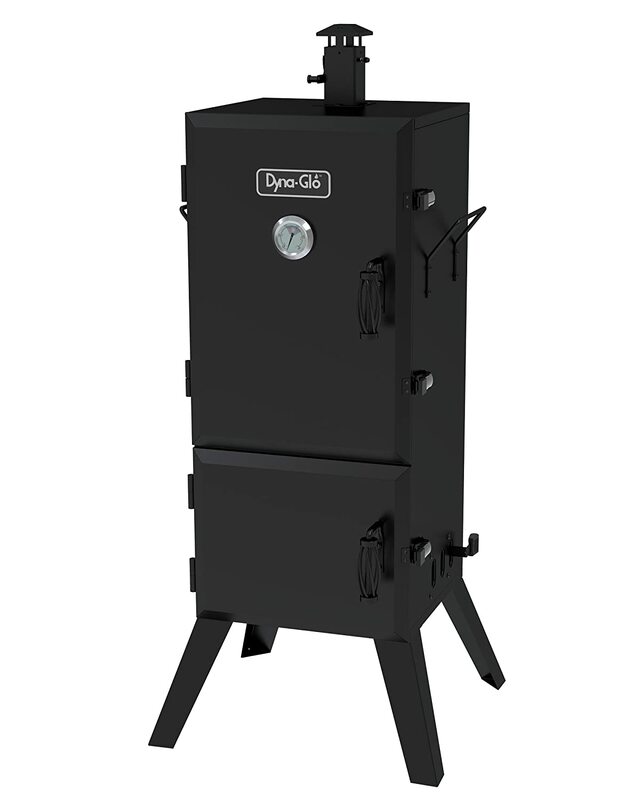 Considering its modest price, this smoker remains popular among BBQ fans the world over. It has a considerable temperature range, maxing out at close to 400 degrees fahrenheit. It doesn’t have the same digital controls of other electric smokers, but it does have a easy-to-use dial and analog thermometer to control and monitor temperature levels. It has 548 square inches of cooking space shared by four cooking racks, making it more than big enough to cater for most users. Despite the impressive temperature range the unit does feel a touch on the light side, notably its air vents. 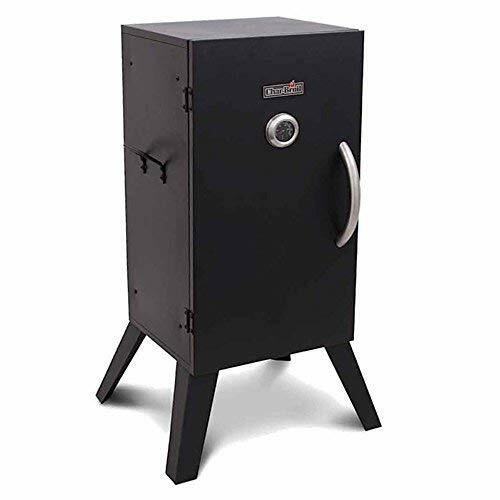 This smoker is really well insulated, particularly with its double door design. This works to reduce heat loss as you tend to your food and wood chips. In turn this helps maintain constant smoking temperatures and makes the smoker much more energy efficient. For me, this is the most important feature a smoker can have. 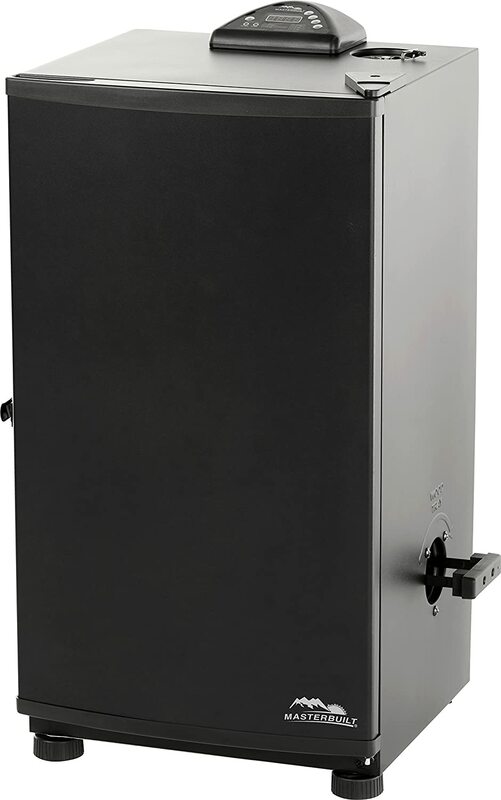 Power and capacity are all great, but the point of electric smokers is to be newcomer-friendly so if it doesn’t have a good control system in place then it’s simply not worth buying. Generally speaking, traditional wood and charcoal models need tending (see how difficult that can be here) and sometimes even intervention for temperature regulation. I’ve sometimes had to resort to keeping a pan of water close by to regulate temperatures if they get out of hand. Electric models are far better regulated, so this inconvenience or lack of control tends not to be an issue. Ideal meat temperatures for smoking tend to sit somewhere around 225-275 degrees fahrenheit (take a look at this meat-by-meat guide to smoking temperatures), so it’s key that your chosen smoker can comfortably sit in that range. The 5 that I chose for this list all do this, so keeping a good cooking temperature shouldn’t be an issue. I think is something of an overlooked feature for smoking, and even grilling more generally, but the setup of the interior of the smoker is really key to its performance. The internal setup of the smoker is a big contributing factor to its performance, with the spread of its racks being crucial to how well (or not) your meat cooks. Obviously size can play a big role here, with large models being able to host multiple racks of meat. Models with removable racks are ideal because it gives you the flexibility to move your food closer to or further away from the heat plates at the bottom of the smoker. While larger smokers obviously allow you to cook more meat, they also give you the option of hanging the meat inside it, instead of just laying it down on the rack. I’m not talking caveats as in the linguistic or literary term, but rather the term used in the barbecue world. Installed caveats in a smoker refer to the ventilation system in a smoker’s combustion chamber, which allows heat and smoke to be released. You’ll need these in your smoker, as they allow good smoke flow in within your smoker. While opting for electric might seem like you’re forfeiting the benefits of wood or charcoal smoking, you do still get to keep faithful to the authentic smoky tastes of BBQ. 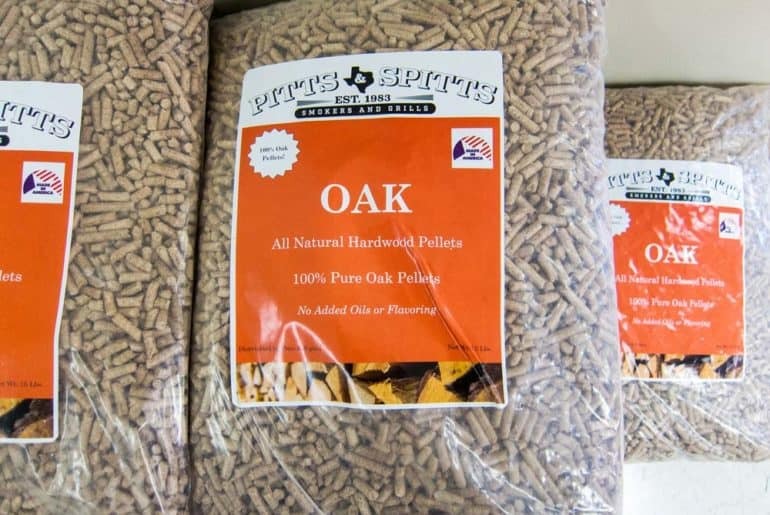 A lot of electric smokers allow you do add wood pellets or chips to them (and read here for why you should use them), which help infuse your meat with authentic barbecue flavor. I love this about electric smokers. With a lot of ‘automatic’ BBQ products, such as gas grills, the trade-off for ease-of-use and convenience is often authenticity. But the chance to add wood chips to your smoker takes some of the romance around wood cooking. Just one warning: Try to make sure that the wood pellet drawer is deep enough to contain a good amount of chips. They can be easy to overload otherwise, which can lead to flames or excess ash, then ruining your smoking and even potentially being a safety hazard. This is my final criterion, but no less key than all the others. The key to smoking is maintaining excellent temperature control throughout the entire process, however if your smoker is not well insulated then it will struggle to keep this temperature over a long enough time. Industry standard is that smokers should feature excellent insulation, but just to be safe I recommend looking out for double wall construction. These models are excellent at heat retention and being energy efficient. When it comes to choosing your new unit, make sure you look beyond just sheer power. While it's great to have a machine that can reach high temperatures, it's also just as important to have something that offers you space, reliability and good performance. I hope this overview helps outline what you need to keep in mind when choosing your new electric smoker.